1844. Single storey and loft 3-bay former fishing booth. Random rubble walls with stugged sandstone dressings. 2-leaf vertically-boarded timber doors fronted by boarded shutters centring E elevation, single small window in bay to left. Rubble forestair to N gable accessing boarded timber door rising into gablehead. Blank E and S elevations. Plate glass fixed light to window; felt tiles and concrete skew-copes to roof with Velux rooflights; single-flue gablehead stack to S.
STEPS: roughly hewn stone slab steps rising from beach to entrance door and to rear of forestair. This bod was set up by Hay & Co in 1844. It was built on a rocky outcrop at the end of a beach on which fish were dried prior to export. 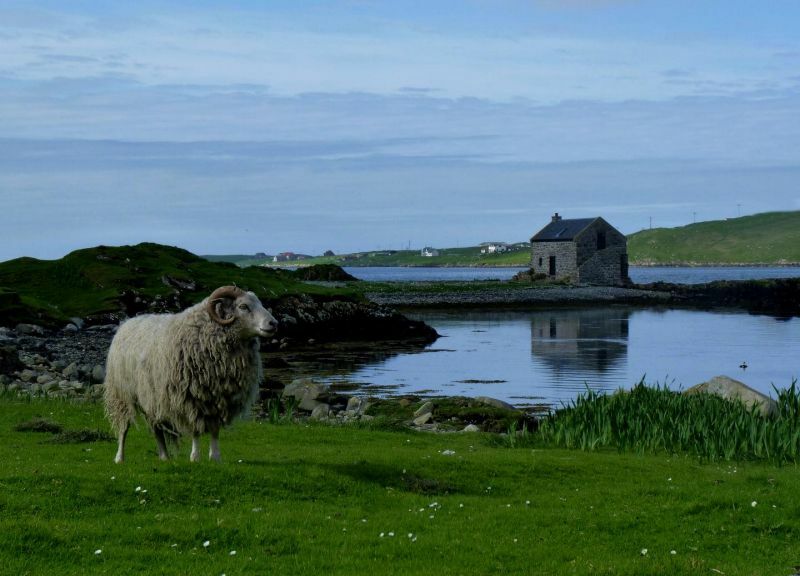 Being situated on a rocky point jutting into the water, this diminutive building is a prominent landmark in Whiteness Voe.